I have eaten my way around the world spending as little as $5 day on food—in Mexico…Barcelona…even Paris. If you follow a few simple tricks you can save a fortune on your daily expenses and get a real taste of the local culture. Below are three tips that will save you significantly no matter where you go. When looking for accommodation try to find a place that includes breakfast. This will save you a bundle over the course of your trip and you’ll start the day with a full belly and buckets of energy. Some Airbnb owners will offer breakfast or tasty home-cooked meals. If you want to splurge, go out for lunch instead of dinner. 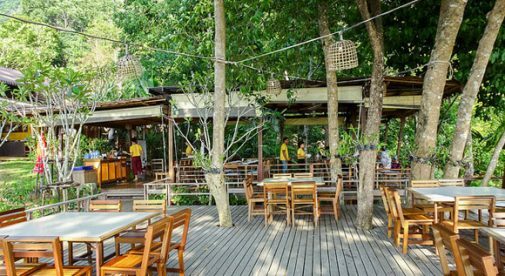 Many places around the world offer a fixed daily menu—often a three-course meal with drinks and dessert included—at a reasonable price. Take a late lunch—around 3 p.m.— and have a small dinner later on. Speaking of dinner, this is the best time to check out the local street food. Food carts are popular with locals for a reason. The food is as authentic, it tastes good, and it’s usually affordable. You can take these tips no matter where you go. In Paris, there are food stalls and inexpensive food almost everywhere. You can easily do groceries in Paris and feast on amazing charcuterie, cheese, and bread and average $5 a day. Below are some photos of low-cost meals that I’ve enjoyed on my travels. $3 (60 Mexican Pesos) for two tostadas and two local beers. I found this dish at a family-owned restaurant in Playa del Carmen, Mexico. 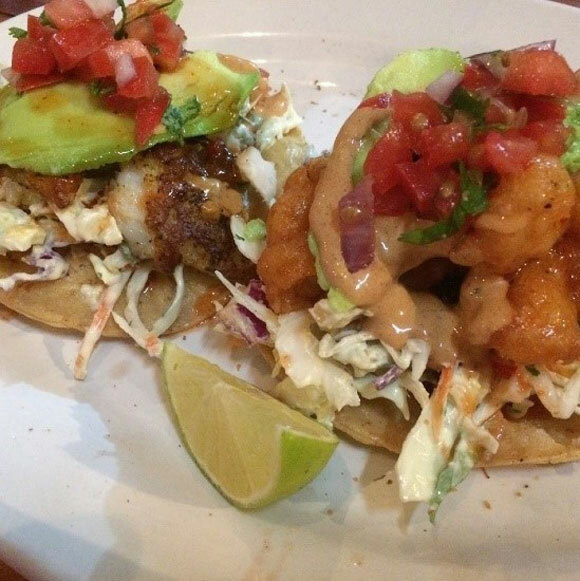 A fish and shrimp tostada, lightly-breaded, and covered in salsa, tamarind sauce, and fresh avocado. The hot sauces are on the side for you to adjust according to your taste. These were just as delicious as they look. $5 pintxos plate in Barcelona, Spain. My favorite meal in Barcelona was also my most affordable. I discovered pintxos (similar to Spanish tapas) in Barcelona’s Passeig de Gracia neighborhood. The area is known for having a variety of establishments offering these bargain meals. 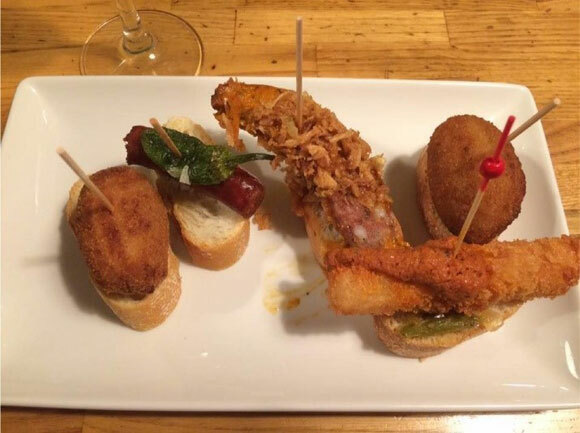 Unlike tapas, which are offered for free when you ordered a drink, pintxos come with a toothpick to make your meal less messy and it is served on a piece of bread. 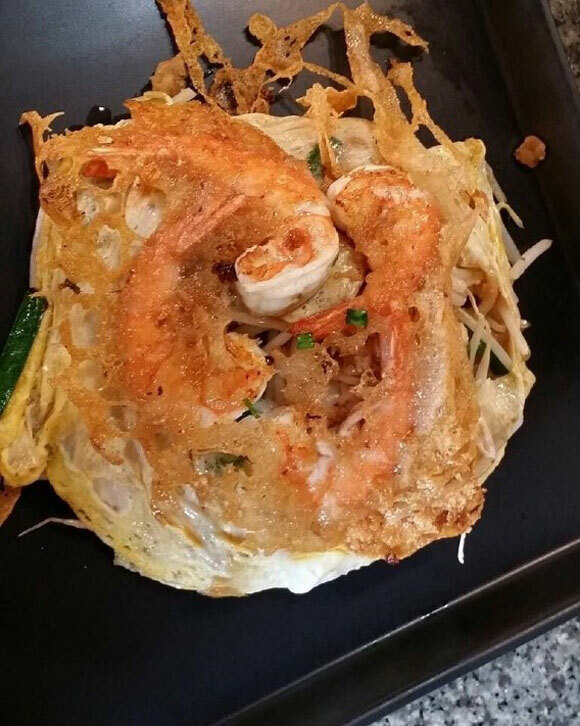 $3 Pad Thai in Thailand. (I splurged on this dish and spent extra to add prawns. Pad Thai is delicious, you’ll find it everywhere in Thailand, and you can get a large plate for as little as $1. However, I ordered this lunch with all the bells and whistles.